Marathons might be an accomplishment, but they're also dull as hell, especially once your Nelly Furtado high wears off. 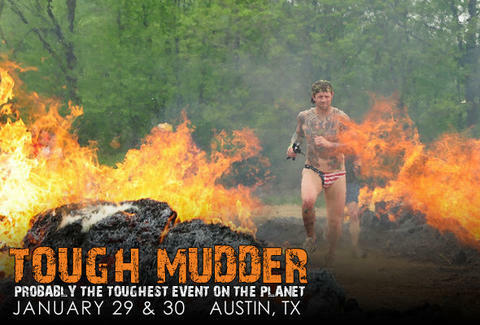 Throw yourself into a pulse-pounding adventure instead: Tough Mudder, hitting Austin, TX this January 29 & 30 as part of an 11-market 2011 U.S. tour. Â Unlike other namby-pamby mud-runs, Tough Mudder is a 10,000-volt jolt to your berserker soul: a 7-12 mile trail run encouraging camaraderie and humor to help you survive 17 balls-to-the-wall obstacles designed by the British Special Forces -- guys who make a living dashing through conditions so hellish, they make Cleveland look like St. Tropez. Instead of monotonously plodding along, you and your comrades will help each other leap over fire, traverse rope bridges, crawl under barbed wire, and navigate underwater tunnels, thus confronting the triple-fear of confined spaces, drowning, and those aliens from The Abyss. Upon finishing, you'll immediately be handed a beer, then head to a party with more beer, bbq, a live band, free (permanent!) tattoos, and any friends/family members you want around to help you celebrate the ultimate achievement: not crying. To further inspire you, Mudder's a proud supporter of the Wounded Warrior Project. So far 20,000 participants have signed up, and Tough Mudders have raised over $435,000 for the cause. Anyone who agrees to raise at least $150 gets $25 off their registration -- putting you that much closer to the ultimate test of maneater. Er, manhood.